Third, Proverbs says that fear (respect, awe) of The Lord is the beginning of wisdom, but that fools despise it (and Him). If God is real, you’d be a fool not to fear Him. After all, this is the God who created the universe, who upholds all things by the word of His power; this is the God who weighs the nations as dust in the scales, holds the keys to life and death. But this is also a God who requires faith, who gives evidence but not irrefutable proof, and who allows all men to choose how they will perceive Him. 1 Corinthians 8:2-3 says, “If any man thinks that he knows anything, he nothings nothing yet that he ought to know; but if any man loves God, the same is known of him.” To see God properly and become wise requires that we assume the right perspective, that we humbly acknowledge where true wisdom comes from and ask the Creator for what only He can give. Back in the heyday of boxing, Mohammed Ali said, “Float like a butterfly, sting like a bee, you can’t hit what you can’t see.” I think he was describing his own speed and elusiveness, but he could have also been talking about wisdom: if you can’t see it, you can’t hit it. A lot of people out there dodge and weave through life, proud of how smart they are or how much they have—even as they make foolish choices or head down destructive paths. 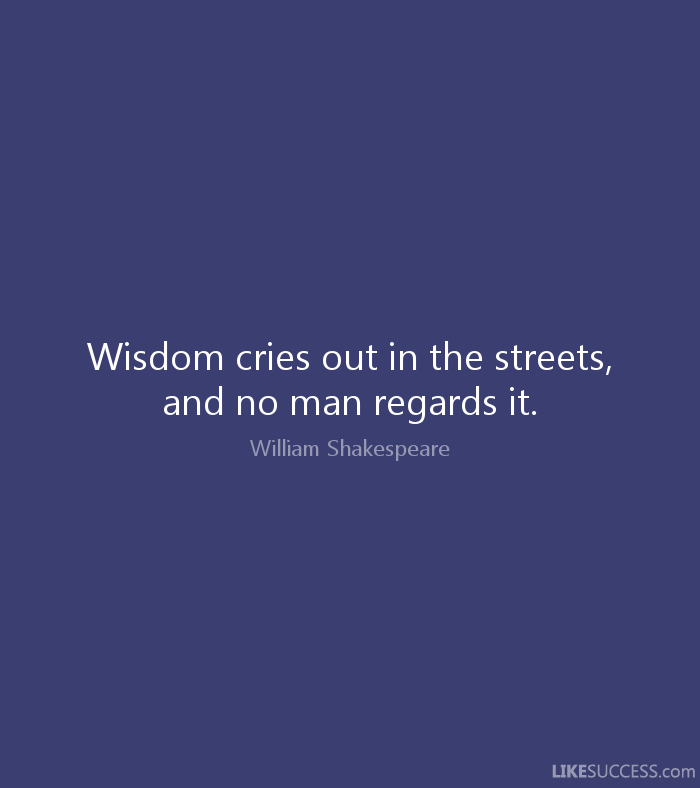 They may be rich or famous, they may even be smart, but somehow wisdom has eluded them. So, next time you encounter a fool, you’ll know what their real problem is. And next time you act the fool instead of making wise choices, well—at least now you know who to ask, right? While millions pass her by because they're too smart or too proud. But James says that it comes from God; we only have to ask. James says that if you ask the Lord for some, He'll surely give it. This entry was posted in Daily Devotions, Poetry, Thought for the day and tagged Bible, Daily Wisdom, Devotional, inspiration, James 1:5, observation, Proverbs, Proverbs 1:20, spiritual, wisdom by admin. Bookmark the permalink.